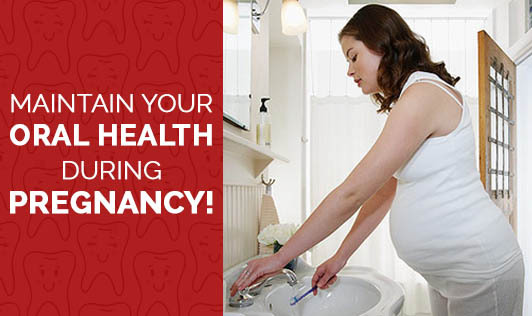 Maintain Your Oral Health During Pregnancy! Let us first know the link between diet during pregnancy and oral health. Eating a well balanced diet is most essential to keep you and your kid nourished throughout pregnancy. Your baby's teeth begin to develop between the third and sixth month of pregnancy, so it is important that you receive sufficient amounts of nutrients - especially calcium, protein, phosphorous, and vitamins A, C, and D.
The mineral calcium, is a crucial one and your baby's needs of this mineral is provided by your diet, not by your teeth. If dietary calcium is inadequate, your body will access this mineral from stores in your bones. An adequate intake of dairy products, green leafy vegetables, poultry or the supplements your gynecologist recommends will help ensure that you get all the calcium you need during your pregnancy. However, during pregnancy, your hormone levels dramatically increase. The rise in progesterone causes your gums to have an exaggerated response to plaque called "gingivitis" and can even lead to tumors in gums. Here is how you need to take care of your teeth and gums during pregnancy. 1.Tenderness, bleeding or gum swelling occurs at any time during your pregnancy, so talk with your dentist as soon as possible. 2.Check with your dentist on medicated toothpastes or mouthwash that can be used throughout pregnancy, in case of any bleeding in the gums. 3.Brush and floss your teeth effectively during your pregnancy. Brush thoroughly after meals or sugary snacks, at least twice a day. 4.Invest in a good tooth brush - opt for a soft, firm bristled brush that will reach all the hard-to-get-to areas at the back of your mouth. 5.If morning sickness is keeping you from brushing your teeth, drink a glass of water instead and return to brushing your teeth around an hour later otherwise the acid from your stomach can cause tooth erosion which will further worsen with brushing. 6.Do not give in to sugar cravings. Go for a healthy well balanced diet that is packed with nutrients. In cases of an emergency, seek appropriate treatment. Tell your dentist the names and dosages of all medications you are taking - including medications and vitamins such as folic acid - as well as any specific medical advice your Gynecologist/ Physician has given you. Your dentist may alter your dental treatment plan based on this information.